Everything you need to know about teaching in the land of the Emerald Equator. Indonesia is a huge, diverse, and insanely beautiful country, with scenery ranging from active volcanoes to calm white sand beaches. Many of its more famous islands like Bali, Java, and Sumatra are hailed by western travelers as paradisaical, and so millions of tourists flock to their resorts on the shores of the Indian Ocean each year. There are also millions of eager English language learners on the islands creating a booming market for new teachers looking to find sweet students and a sun-soaked lifestyle. If you dream of colorful markets, ancient temples, and surf-worthy waves, read on to consider the benefits of finding teaching work in the country. A paradise for backpackers, island hoppers and adventurous teachers of all ages. 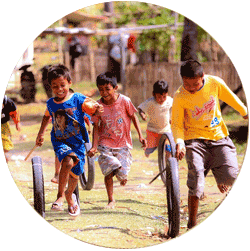 The official language is Bahasa, but you’ll find over 700 languages in use by communities across the different Islands! Hot and humid, with an especially wet summer season. Wages in Indonesia may aren’t the highest in the world, but are easily sufficient for a great lifestyle while you are on the islands. Typically, if you are working at a language center, such as English First (EF) the salary will range between $900-$1400 usd per month, sometimes with added benefits such as plane tickets and health insurance. The pay range will be higher for placements at international schools or private schools. Public school jobs are unavailable as funds are usually lacking for foreign teachers. University positions will require more qualifications, preferably an MA, and some previous work experience in the country, so new teachers should be looking at language schools, or international schools if they have teaching certification to get a foot in the door. 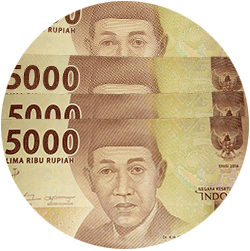 The cost of living in Indonesia can vary by island and city between $500-$900, with the capital Jakarta on the upper end of the spectrum and smaller cities and towns on the lower end. With some planning, even a salary of $800-$900 can add up to small savings, which can be used to travel around the islands or further out to other Southeast Asian countries. 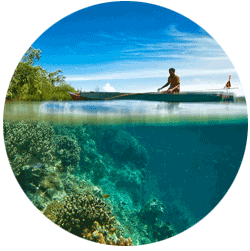 Indonesia is made up of numerous islands grouped together between the Indian and Pacific Oceans. As such, you’ll find a range of different environments in each area. You could opt to teach in Jakarta on Java island, with its more metropolitan feel, or you could explore a little further teach among the local communities on the smaller islands. More than half of the Indo population lives on Java island and the capital Jakarta is home to many universities and private institutions. Many of the vacancies that become available will be in or near the city. While Jakarta may not be what you picture in your Indo dream, as the greenery in the area is quite limited, it still has plenty to offer in terms of night life, restaurants, shopping and museums. There is certainly always something to do. There is also an airport with affordable short hopper flights to other islands, so weekend trips are doable. Sumatra is catching up with Java in popularity and the number of opportunities for new teachers seems to be rising steadily with Medan attracting the most new recruits. Sumatra is known for its wildlife and is a major go-to for adventure lovers and trekkers. It is one of the very few places in the world to see orangutans, so also brings in just about anybody who is fascinated with primatology or rare species. If you want proximity to real jungle life, it is a great option. Probably, when you do fantasize about living in Indonesia tropical Bali is the fantasy. The island is the tourist mecca of Indonesia, due to the almost indulgent amount of natural beauty. It has everything: jungles, volcanoes, beaches, and quaint towns. 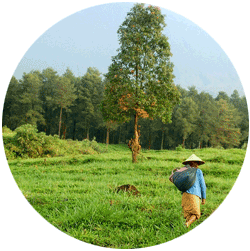 Jobs in Bali are few and sometimes far between, but do come up. If you have good experience and a TEFL qualification it may be worth it to wait for a position, or to make connections on the island who can relay information if they hear of any new openings. In Indonesia everything can be made more delicious with a little spicy sambal or sweetened up with peanut sauce. Here are some of your rice, meat, salad, and soup day-to-day options, though there are hundreds of others you will discover once in country. 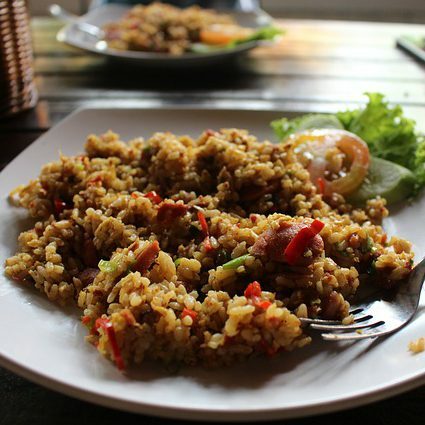 Nasi goreng is Indonesia’s delicious take on fried rice. It can be sweet, savory and spicy all at once, and is flavored with a sweet soy sauce called “kecap manis”. Satay is meat slathered in turmeric and barbequed. 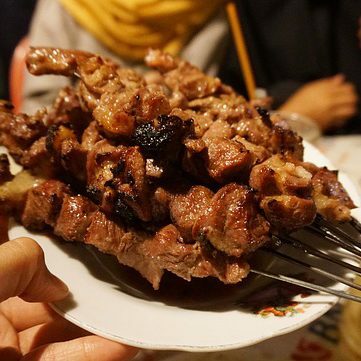 The most famous satay and sauce combination is chicken with peanut sauce, but you can find more exotic meats like goat or even rabbit. 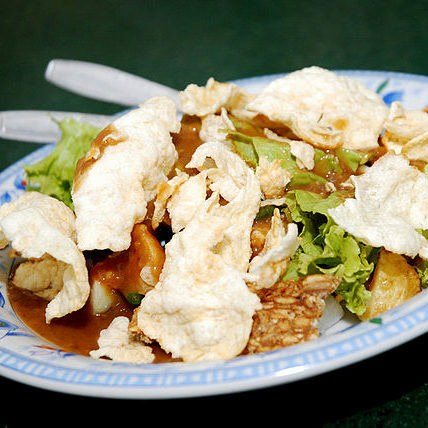 Gado Gado is a mixed vegetable salad with peanut sauce. Notice the frequency of the use of peanut sauce? Indo dishes that have peanut sauce are the best. While it’s possible to get a job without teaching experience, it’s much easier if you have at least some experience under your belt. You can get your foot in the door with a large commercial language center, or plan to search while living in the country for a month or two and, to be on the safe side, focus your search in cities in either Java or Sumatra. It is possible to get a job with a large commercial chain before arrival, but otherwise much better to conduct your job search while in the country. You will need a TEFL certificate and a bachelors degree to be competitive for most jobs.